There were several small dairies in Wolverton before WWII, but I think that legislation which required that all milk be either pasteurized or tuberculin tested finished off small dairies. The ones that were operating in Wolverton pre-1939 were Reuben Bremeyer (mentioned in the previous post), G Young at 133, Church Street, Maypole Dairy at 18 Stratford Road, and the Co-op Dairy at the back of the West End Grocery on Church Street. 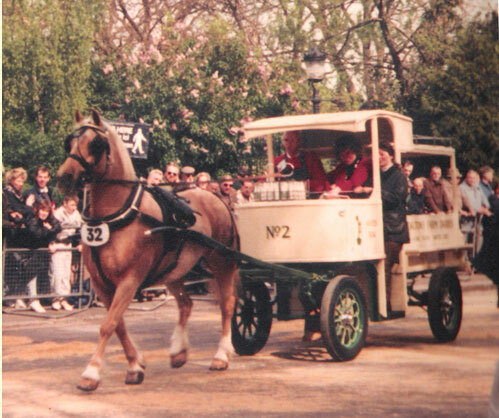 At the time I was a boy only the Co-op supplied milk which was delivered each morning on a horse-drawn dray. The delivery was effected by a Mr and Mrs Odell, each dressed in a brown smock, who would place the bottles on the doorstep. The system was that you bought milk tokens from the Co-op and placed them on the doorstep overnight depending on what you wanted that day. You could still get natural milk in villages and as I remember it was always rich and creamy and far tastier than the pasteurized milk we consumed on a daily basis. There is probably scientific evidence to show that the process does reduce nutrition as well as kill off any pathogens that might lurk in the natural substance. The irony is that it was the growth of industrial dairies that increased the health risks from raw milk and made pastuerization necessary. The small dairies and the farm gate probably offered minimal risk to the local consumer. The article below illustrates the debate in 1938. There is no substitute for clean, raw milk as a food, so far as children are concerned. Science has not yet succeeded in providing, in the pasteurized variety, those essential qualities that are the only real foundation for a healthy child. If we are to be compelled to drink pasteurized milk, we should at least understand what pasteurization means. It set out to accomplish two things: Destruction of certain disease-carrying germs and the prevention of souring milk. These results are obtained by keeping the milk at a temperature of 145 degrees to 150 degrees F. for half an hour, at least, and then reducing the temperature to not more than 55 degrees F.
It is undoubtedly beneficial to destroy dangerous germs, but pasteurization does more than this-it kills off harmless and useful germs alike, and by subjecting the milk to high temperatures, destroys some nutritious constituents. With regards to the prevention of souring; sour raw milk is very widely used. It is given to invalids, being easily digested, laxative in its properties, and not unpleasant to take. But, after pasteurization, the lactic acid bacilli are killed. The milk, in consequence, cannot become sour and quickly decomposes, while undesirable germs multiply very quickly. Pasteurization’s great claim to popularity is the widespread belief, fostered by its supporters, that tuberculosis in children is caused by the harmful germs found in raw milk. Scientists have examined and tested thousands of milk samples, and experiments have been carried out on hundreds of animals in regard to this problem of disease-carrying by milk. But the one vital fact that seems to have been completely missed is that it is CLEAN, raw milk that is wanted. If this can be guaranteed, no other form of food for children can, or should, be allowed to take its place. Dirty milk, of course, is like any other form of impure food — a definite menace. But Certified Grade A Milk, produced under Government supervision and guaranteed absolutely clean, is available practically all over the country and is the dairy-farmer’s answer to the pasteurization zealots. Recent figures published regarding the spread of tuberculosis by milk show, among other facts, that over a period of five years, during which time 70 children belonging to a special organization received a pint of raw milk daily. One case only of the disease occurred. During a similar period when pasteurized milk had been given, 14 cases were reported. Besides destroying part of the vitamin C contained in raw milk and encouraging growth of harmful bacteria, pasteurization turns the sugar of milk, known as lactose, into beta-lactose — which is far more soluble and therefore more rapidly absorbed in the system, with the result that the child soon becomes hungry again. Probably pasteurization’s worst offence is that it makes insoluable the major part of the calcium contained in raw milk. This frequently leads to rickets, bad teeth, and nervous troubles, for sufficient calcium content is vital to children; and with the loss of phosphorus also associated with calcium, bone and breain formation suffer serious setbacks. Pasteurization also destroys 20 percent of the iodine present in raw milk, causes constipation and generally takes from the milk its most vital qualities. In face of these facts-which are undeniable-what has the Pasteurization Party to say? Instead of compelling dealers to set up expensive machinery for turning raw milk into something that is definitely not what it sets out to be — a nutritious, health giving food — let them pass legislation making the dairy-farmers produce clean, raw milk — that is milk pure to drink with all its constituents unaltered.